The American Star bicycle reversed the penny farthing arrangement and has the small wheel, 18 inches in diameter, at the front, which was for steering, and the large wheel at the rear. Both wheels have steel radial butted spokes and solid rubber tyres. The bicycle is operated by levers and ratchet gear from the rear wheel. The levers carry the pedals on the forward ends and are hinged at the rear to projections on the lower rod of the frame behind the hub. At the bend of the levers, below the hub, leather straps are attached to pins. The straps pass around drums on the driving wheel axles. Pressure on the levers draws down the straps and rotates the drums, which drive the wheel through a ratchet arrangement. A spring within the drum winds up the strap and raises the lever to make it ready for the next stroke. The levers can be depressed alternately or, when increased speed is required, simultaneously. There are two steps up to the non-original saddle, which is clamped to the saddle spring. A spoon brake from the handle bars operates on the rear wheel. The bicycle is now finished in black but when acquired by the Museum in 1954 was painted in blue house paint. On right lever: "SHOCKSTOPS". On front hub: "1803 / H.B. Smith Machine Co / Smithville N.J. / Patented Oct 26th / and Nov 23rd 1880 / January 29 1884". The American Star was patented in the United States of America by George W. Pressey of Hammonton, New Jersey, in 1880. It was put into production under licence by the H.B. (Hezekiah Bradley) Smith Machine Co. of Smithville, Burlington County, New Jersey, a manufacturer of wood working machinery, the following year. In 1889 Smith even patented a steam powered tricycle. The name "American Star" was derived from the double star-shaped spoke pattern on the earliest models. The front wheel diameter was about 18 inches (46 cm), while the rear wheels went from 42 inches (107 cm) to 60 inches (152 cm). Initially the American Star was slow to gain acceptance. Customers initially complained about the non-adjustable spoke riveted into the rims, very heavy frame of solid steel and the lack of a brake. 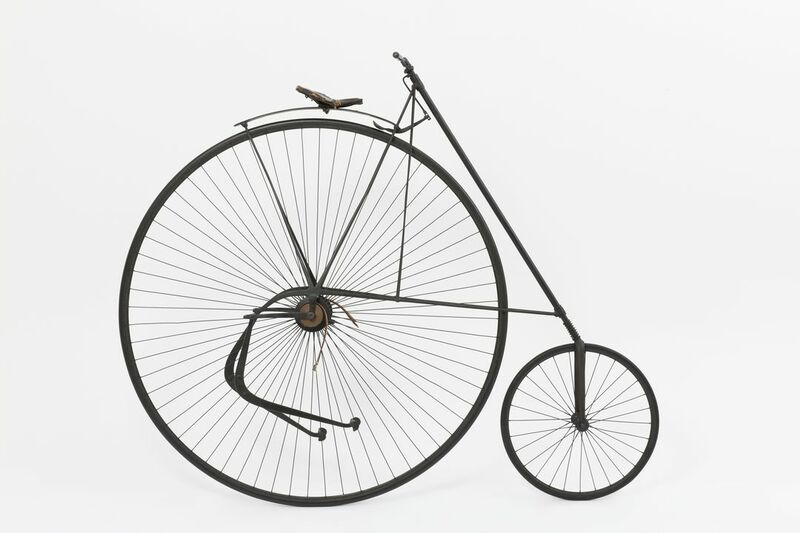 The 1882 model made improvements and eventually American Star bicycles featured all the refinements of the ordinary (penny farthing) bicycles with hollow frames and rims, tangential spokes, and improved saddles. The American Star was touted as a safe alternative to the penny farthing by eliminating falls forward over the front wheel. However, the lack of weight over the small front wheel caused the bicycle steering to become loose over gravelled surfaces tending to throw the rider sideways instead. Also, the spring in the axle drum could not be made strong enough to lift the foot at the end of the power stroke so the foot had to be lifted after each stroke, which made the bicycle tiring on long rides. It was also the only bicycle of the period, other than the Eagle, which permitted the rider to stand on the levers for an extra push going up hills and consequently won numerous hill climb events and timed races. Furthermore, because of the adjustability of the treadles in the drive mechanism to the leg length, the bicycle did not need to be made to measure and could be ridden by anyone in the family. An alternative leverage mechanism was provided that allowed the leverage of the treadles to be altered. When kicked forward, this mechanism lengthened the leverage thereby affecting a "low gear", or kicked backwards shortening the lever into a "high gear". American Star bicycles were available in six models. Nothing is known of the history of the bicycle other than that it was donated to the Museum by the Sydney Bicycle and Motor Club, Carrington Street, Sydney in 1952.